Are Blog commenting and Forum post on High DA Sites still work for SEO? Are Forum Posting and Blog Commenting on High DA/PA Sites still works For SEO? A few years back blogging and digital marketing was much easier than now. People had to build some good content and after that, have some good PR blog commenting, to rank that blog or keywords. But, somehow, we should say people exploded blog commenting and forum posting, and now it has been restricted, not in the way you understood, but you need to go steady with niche related blogs. Google with the launch of Penguin in 2012 had already closed the door of the automated tools like Scrapbox. People had to use some tools, and this tool creates an immense amount of backlinks to rank the blog. But, somehow manual backlinks still got some spaces, and if you are successful to create some High PR blog and forum posting of your blog, you can have some of the benefits at the end. For those who are newbies and do not have enough knowledge of what Blog commenting and Forum posting is? Blog commenting is the procedure for interactions of the blogs, bloggers and the readers. When someone on a blog, comment to ask something or to mention something, some of the blogger or the admin comment there to answer the feedback and if you are a blogger, you can put the link of your blog in explaining the answer of that question. Blog commenting is really exploded by the bloggers, and you would have seen some blogs having thousands of the comments and every comment with a backlink. Blog commenting is a good way to exchange thoughts, and opinions about the written topics and articles. Forums or internet forums are message boards, posted by some company, some websites and some non-profit organizations. The message boards available on there, people can communicate with each other on there and can share views. In order to post something or to share the views one has to create a profile there. You can search categories as well- to post your website links while sharing your views on some topics or points. Forum posting also considered as the good way to get quality backlinks, you need to check the spam score of the website, in order to get benefits from that forums. There can be thousands of the forums; you can search on Google to get the lists of the forums. 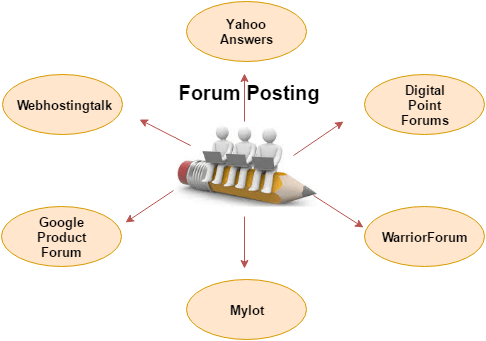 Do forum posting and blog commenting still work for SEO? As I mentioned, Blog commenting and forum posting is one of the oldest and effective ways to increase the website traffic and links. But, you need to go very cautiously, as it can harm the site ranking the other way. Commenting on the blogs can help you to have some good relationship with the other fellow bloggers. But, you need to really provide the solutions of the given questions or asked a question. You should do comment very often on some blogs- the more consistent you are, the more likely you to build relations. Over time, if you got grip on your niche- you will get more opportunities, and people will directly ask you question, related to your niche. Blog commenting can build the brand awareness. If you are running a blog, and you do have complete knowledge of that niche, you are giving an answer to the questions; your profile will become a brand in that specific niche. People, even the author of the blog, will look upon you if someone is asking something out of the box. Off-course, while answering the question on some blogs in commenting, you can refer to your blog. In that way, not only you will get a quality backlink but the quality traffic as well. And targeted traffic got the value, who else knows better than you. The same thing goes with the forum posting. Forum Posting is also somehow interesting when you get too engaged with different people. You provide the solutions, and sometimes, you also can be blown off by some other blogger or users. You need to find forums related to your blogs, you can search on Google and can find many forums related to your niche. By forum posting, you can create your new topics, if the topic is already not there. Create the new category and start discussing on that- ask another participant to take part in that discussion. But, only three to four links from one forum will be more than enough, Instead, you get 400 links, and get penalized by Google over spam. But, do not explode the forum posting or blog commenting, there should be a ratio of it. Google loves the verities of the backlinks. And you should come to know; only do-follow backlinks also can harm the website. This is really a very nice information. One should always keep in mind nowadays while doing SEO.